Next Book Review: The Tutor by K. Larsen is LIVE! 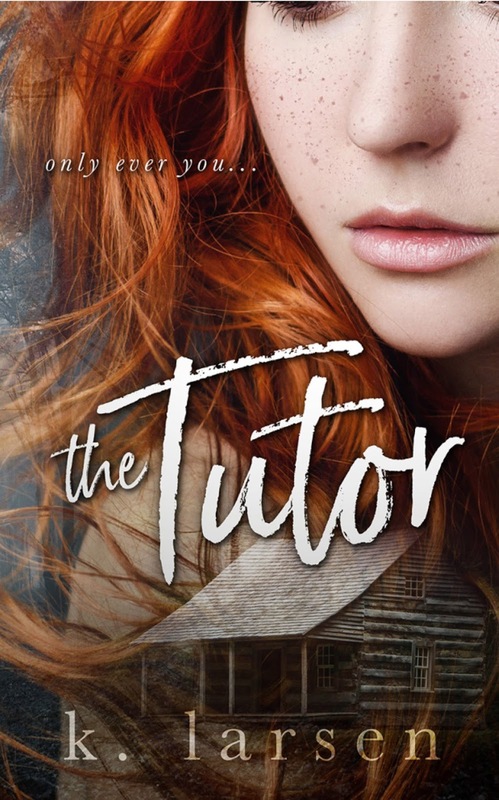 The Tutor by K. Larsen is LIVE! After a party gone wrong and in desperate need of money for the fall semester of college, twenty-year-old Nora Robertson needs to escape her hometown. She accepts a summer long live-in tutoring job for a handsome man and his little sister at a secluded home deep in the mountains. No internet or cell service. When her tutoring job ends she's hit with a brutal turn of events ... she's not permitted to leave. Holden dressed me that first day out of the box. He dressed me and left me in his bedroom on his bed. I sobbed until my body had no more liquid to expel. I curled into a tiny ball and willed everything not to be true. At some point, probably mid-day, he came in with a bucket, washcloth, and tray of food. He gently, tenderly almost, sat me up and fed me. Small bites. He murmured that things would be okay. That I would see. When the food was gone, he lifted my dress from my body. I stared at the wall unmoving. He dampened the washcloth and washed me head to toe. There was nothing sexual about it. It was simply cleaning the filth and stench from my skin. If I’m honest, I almost enjoyed it. Being clean is something we take for granted. He left me in his room after a swift kiss on the crown of my head until dinner. He brought in a tray and fed me again. Afterward, he brushed my hair free of all the knots and braided it. When he finished I laid back down and squeezed my eyes shut so tightly that the apples of my cheeks began to burn. I stare at the gray sky. I shudder and worry about what might be watching from the thicket of woods nearby. I can’t nod and my mouth makes no sound. For a moment I feel weightless. Free. I imagine it’s how birds feel soaring through the sky. Gravity quickly reminds me that something’s amiss. My leg feels like it’s on fire. I wince when I’m jostled into some kind of metal box. An ambulance. The sterile hygienic odor hits me like a brick in the face. Everything is a watery blur from behind the rain-streaked windows of the ambulance doors. People have a deep-seated craving for a sense of family, belonging, identity. I squeeze my eyes shut. Looking back, I realize that he probably interviewed lots of different girls for the job and picked the one he thought would be easiest. It wasn’t just the girl he chose but the life she came from as well. “Nora, stay with me.” The paramedic’s voice is deep and oddly soothing. It pulls me from my thoughts. I open my eyes, slide my gaze from the ceiling to him. I want to know what he looks like but my eyes won’t focus enough to get a good look. He pokes at me with something as if I am a large bug to be inspected. My body screams with pain. It feels like there’s a noose around my throat so tight stars dance in my eyes. I’ve experienced this before though. I can survive. Life’s made me numb. I squeeze my eyes shut again. I jolt awake—disoriented. Lotte? Tubes snake in and out of me. I’m covered in soft blue and don’t feel gritty with dirt anymore. The steady beeps of nearby monitors hurts my ears. So much white noise. A symphony of electronic background sound that’s headache inducing. I’ve been too used to the quiet of nature for too long. The door to the room is closed. I don’t like closed doors. Panic jumpstarts my heart. I’m trapped. Again. My leg is hoisted up and in a cast. I squint trying to recall the proper name for the contraption. My sternum aches and I have white lights dancing in my peripheral vision. The door opens. Please be Lotte. A man in a gray suit enters the room. I lift my head slightly. “Hello, Nora.” I don’t know who he is. I squint at him as he surveys me while chewing a nail. It’s strange to think of the unexpected turns a person’s life can take. “I’m detective Salve. And I need to ask you some questions.” I feel my face wrinkle in confusion. “Do you remember what happened?” he asks. I drop my head to the thin pillow; stare at the ceiling as he pulls a chair next to the bed. “I was in a car accident.” My voice is a raspy whisper. When I chance a look at him again, he’s nodding. “Yes. That’s good. Do you need anything?” he asks. Not from you. “Water,” I answer. And Lotte. “Sure thing. Hang on.” He stands, the chair legs scrape across the floor and I cringe at the noise. When he returns he holds a small cup of water out at me, a straw plunged into it. He’s younger than Holden by maybe a few years from the looks of it. I wonder how long he’s been a detective. His brown hair is close cropped and his nose has a bump in the bridge. He has nice eyes and an easy smile. A nice face, Angela would say. I take the cup from him and chance a small sip. It’s hard to swallow but I manage. I set the cup down on the table next to the bed. “So, Nora, what’s your last name?” he asks. Detective Salve lifts an eyebrow at me. “Really.” I lick my dry lips. “Twenty-one.” He eyes me then. Takes me in. “March 19th, 1996.” I know what he’s thinking- I look younger than I am. I always have. And I’m only just twenty-one. “Do you want me to call your parents?” I shake my head. “I don’t have any,” I answer. Like most people who grew up without parents, over the years I have collected little tidbits of life knowledge, scraps and bits from friends parents, teachers, and employers. Anyone who offered up a touch of wisdom and I kept them like fabric remnants so that I could someday crochet them into a nonsensical afghan that might somehow make my life better—easier. But that is the problem with crocheting-it’s full of holes. Right now I’d kill to have a parent. I don’t know where he is. I don’t know where Lotte is. I don’t know if I’m close to home or close to the farm. I stare at the ceiling again. A nurse comes in and explains that she’s taking my vitals, upping my fluids and asks if I need anything for my pain level. I want the detective to leave. He gives me an uneasy feeling. Men aren’t to be trusted. They have hidden dark needs they want filled. He wouldn’t want me talking to any men. Dara, the nurse, writes her name on a whiteboard and tells me to let her know if I need anything at all. She gives Detective Salve the side-eye as she leaves. I decide I like her. “Call Angela Clark.” I give him the phone number and wait for him to leave. We’re not done yet. He told me that. But at least the unidentified girl in the car wreck has been identified. I buzz the nurse. She’s quick. “My head is killing me.” Dara nods while simultaneously darting around. She reminds me of a butterfly with their erratic flight patterns. She’s dainty and delicate looking. Before I can blink twice she’s handing me pills and the cup of water from the table. I swallow them down quick. “You should really try and sleep. The Doctor will be around to fill you in soon.” I bite my bottom lip and try to make myself comfortable before I close my eyes. I shouldn’t close my eyes. I feel guilty for not getting up. For not finding Lotte or asking about her but if I’m here–safe, she’s probably here–safe. Scared but safe. When I sleep my brain doesn’t hurt. The world is quiet. At least it used to be that way. Sleep was a heavenly escape. I didn’t dream. Sleep provided me sweet escape for eight hours. It’s dark out when I wake. Rather, when I’m roused from sleep. “Ms. Robertson.” An unfamiliar voice. I blink a few times before rubbing away the sleep crusties. My mouth is dry again. My leg throbs. My chest aches. Is this a broken heart? I stuff the idea way deep down- for Lotte. “Nora,” I scratch out. He tucks my chart under his armpit and hands my water to me. I drink the remaining liquid. It’s not enough. I’m somnolent and feel desiccated. “Yes,” I answer. The road was uneven and icy. I remember screaming at Lotte to hang on as I yanked the wheel and slammed the brake pedal. “Okay. Where’s Lotte?” I ask. He stares at me a beat. He pinches his lips closed. Swings his tongue around his teeth behind his bottom lip. “As far as I know, there was no one else recovered at the scene.” He looks everywhere but me. Recovered. The word doesn’t sit right with me. “That can’t be right. She was in the truck with me.” I close my eyes, recall what I can. I know she was with me. He stares at me intently now. “When can I leave?” I ask. Now I do laugh. “That doesn’t sound very soon.” “It’s all relative,” he says with an easy grin. “Also, the EMTs didn’t recover any personal effects. Do you have health insurance or an emergency contact you’d like on file?” I frown and shake my head. “I already spoke with a detective. He’s calling someone for me but I don’t have insurance,” I groan. “You arrived,” he looks at his watch. A big fancy one. One that looks expensive. I can hear the ticking from my bed. It’s amazing how much more you use your other senses after months living in the woods. “Oh.” “Do you have any questions for me, Nora?” My gut clenches. “No. I’m fine.” The better I begin to feel, the more rested I am, the worse my panic becomes. He’s still out there and Lotte is missing. I am in deep trouble. with a bit of dark romance tossed in for good measure! There is just so much I want to say about this book but this is a book the reader needs to read and enjoy first hand! I wish I could reread if for the first time again! If you are on the fence about purchasing this book, jump off… I don’t profit one way or another from my blog so what I tell you, I say honestly and with only with love for books and the written word. This book is worth it! Give it a try! You will NOT regret the purchase… you might regret not being able to site in one setting and consuming the book from first to last word!! THE LAST GUY IS LIVE!